The chemicals used to fluoridate drinking water are derived from the manufacture of phosphate fertilizer. Captured in the industry’s wet scrubbing systems, these chemicals contain a number of contaminants (e.g. arsenic, lead) not found in pharmaceutical grade fluoride. Of greater interest is the fact that 2 recent peer-reviewed studies (Neurotoxicology, December 2000; International Journal of Environmental Studies, September 1999), have found an association between consumption of water containing hydrofluosilicic acid or sodium silicofluoride (the most commonly used fluoridation chemicals) and higher blood lead levels in children. I often hear the phrase “sodium fluoride” thrown around as being the main questionable additive in our water supply. But we hear nothing of silicofluorides that make up 91% of the “fluoride” compounds that are added to public water supplies. Maybe they are all the same thing, maybe they are not, I’m not a chemist but what gives me pause is that in a November 2000 letter from the EPA, they admitted that they have no information on the effects of silicofluorides on heath and behavior. You might want to read that again. The EPA has NO data on the effects of silicofluorides on our health and they are dumping into our water! We are drinking and bathing in this stuff every day! “[L]aboratory and epidemiologic research suggests that fluoride prevents dental caries [cavities] predominately after eruption of the tooth into the mouth, and its actions primarily are topical for both adults and children” (CDC, 1999, MMWR 48: 933-940). – Dr. David C. Kennedy is the Past President of the International Academy of Oral Medicine and Toxicology. His BA is in Comparative Biochemistry and Physiology from the University of Kansas (1967) and his Doctorate of Dental Surgery is from the University of Missouri (1971). In 1979 the FDA required the deletion of all government references previously classifying fluoride as “essential or probably essential” (Federal Register, March 16, 1979, pg. 16006). The verdict? Drinking fluoride does NOTHING for your teeth at all, period. We are told that if a pea-sized amount of toothpaste containing sodium fluoride is swallowed, we might want to call poison control; check the back of your toothpaste tube. So how much fluoride is there in our drinking water? A dentist over at OralAnswers.com did an experiment to find out exactly how much fluoride there is in our water LINK. It’s interesting to note that black tea has some of the highest concentrations mentioned, as high as 3.0+ parts per million! Public water is anywhere from 0.7 to 1.2 parts per million or ppm. 4 parts per million is the maximum that is recommended for consumption. But I wonder if you tallied up all the food and water you ingest and how much is absorbed into your body via brushing your teeth and showering if we would discover that we are all receiving a much higher dosage collectively than we think. But our dentists and government tell us that fluoride is good for us and that it has helped lower tooth decay everywhere it has been implemented; that’s what they claim. 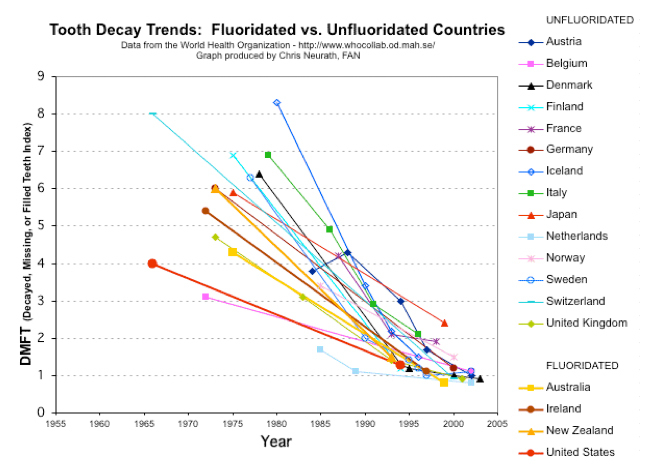 However the World Health Organization did a study where they found that the rates of tooth decay worldwide have been declining whether or not the country is fluoridating their water – interesting. So what’s the motive for fluoridating water supplies if it has no effect on cavities through ingestion? You be the judge. Should we be forced to consume any amount of toxic compounds against our will or should the government be allowed to put anything it wants into the water supply if it deems it necessary?